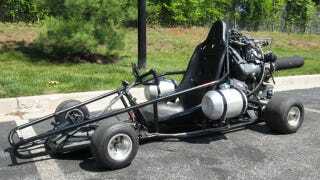 Will You Be the Next Owner of This Jet-Engine Powered Go-Kart? Veteran vehicle tinkerer Seth Kittleman has his latest creation up for sale on eBay, with a current bid of $6,200 and just over 2 days left till the auction closes (June 17, at 20:08 PDT). The kart is said to reach speeds of over 100mph, propelled by more than 200 pounds of thrust from a reclaimed Boeing 502-7 gas turbine engine. GizMag reports that the kart features spun aluminum fuel cells, a digital speedometer, a new N1 gas producer tachometer (which indicates turbine RPMs), and an auxiliary start kit. Kettleman is currently working on a new exhaust nozzle that he claims should further increase the top speed, and has offered to build an afterburner for the new owner – mostly just for the flames and smoke it would produce.